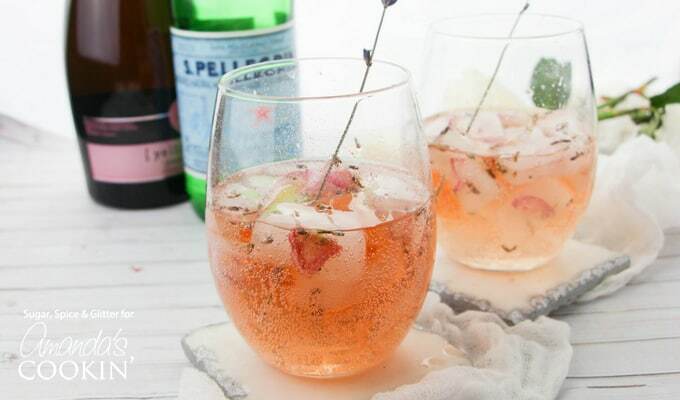 Lavender Rose Spritzer: made with fresh lavender, rose petals and rosé! If you’re looking for a classy and elegant cocktail recipe, look no further than our unique Lavender Rose Spritzer with fresh lavender, rose petals and sparkling rosé! 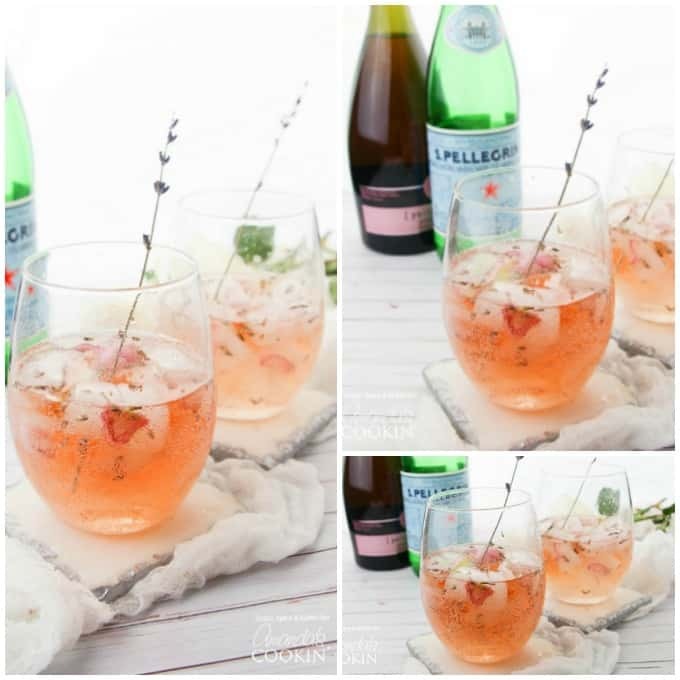 When I think “spritzer,” I think of garden parties, warm summer patios, and afternoon get-togethers that you want to add some pizzazz to without indulging in a full-out champagne buzz. It’s a refreshing cocktail that is half (mineral) water, though you wouldn’t know it to taste it! 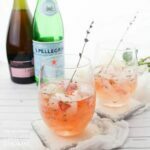 So, with that summery, garden theme in mind, while brainstorming a fun twist on a rosé spritzer, I became obsessed with the idea to make a sparkling floral cocktail. Something so incredibly special and noteworthy that it could be the “feature cocktail” at almost any occasion where spritzers would be served. 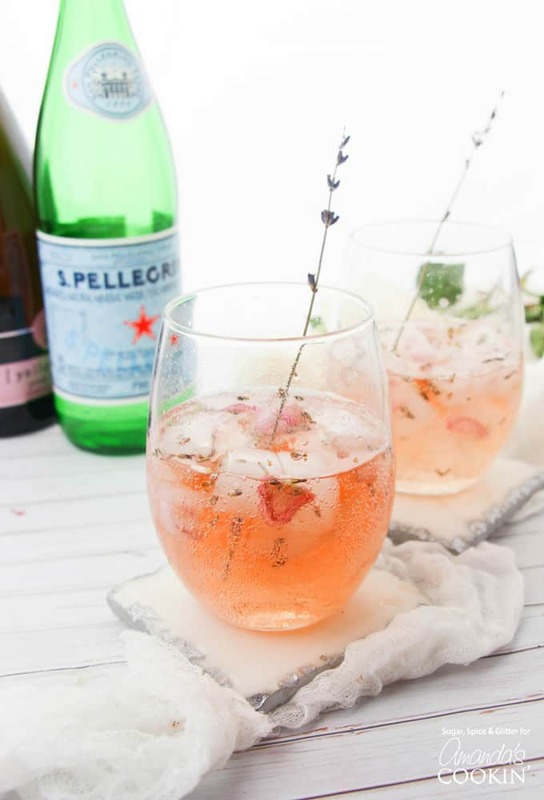 These Lavender Rose Spitzer cocktails are so unique and refreshing – perfect for adding a bit of whimsy to your get-together. Sharing the beautiful look and taste of lavender is this Lavender Lemonade, which is a kid-friendly (and LOVED by adults) lemonade recipe that’s all around classy and delicious. I whipped up quick floral ice cubes (with rose petals and lavender buds suspended in the cube for a touch of whimsy) and set a bottle of sparkling rosé and a bottle of mineral water in the fridge. (Club soda also works beautifully.) You can also use regular rosé but I figured some extra fizz wouldn’t hurt anything! The lavender scent and flavor become more pronounced as the ice cubes melt, so avoid the temptation to add additional lavender while you are preparing your cocktails. Do you have a special occasion coming up that these sparkling rosé lavender spritzers would be perfect for? Don’t miss our Mimosas Recipe for the perfect brunch cocktail for you and some friends! Or if you’re looking for more of a summer-style blended cocktail, look no further than this delicious classic Strawberry Margarita! 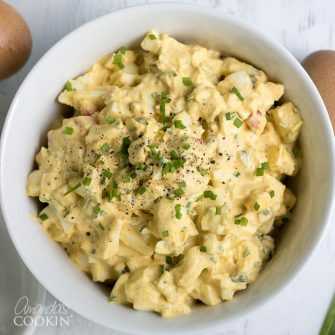 Perfect for hot summer days, BBQs, or for lounging around with friends and family. Rum Punch is another crowd favorite, great for the Fourth of July and any cookouts you’ll be having this summer! And just wait… It gets even better… Wine Slushies! That’s right, wine slushies. I think that one speaks for itself, am I right? Start making your ice cubes at least 3 hours before you plan to make your cocktails. Freeze for at least an hour, then top up the trays with water (and optionally - a few more lavender buds. When ready to serve, place approximately 6 ice cubes in each glass and fill halfway with mineral water or club soda. Garnish with lavender stalks, if using, and add a splash of rose water. Fill the glass with sparkling rosé and serve immediately.